I know that title is silly but I couldn’t resist. I have absolutely no idea where this week went. It was Sunday then it was today. Chris and I painted our bathroom and did lots of spring cleaning. It feels so wonderful and “light” in here now. It motivated me to finally finish these socks. Aren’t they beautiful? I love them. Super comfy and the perfect length in the leg. I like my sock legs to be on the long side. This is the reason I knit these. 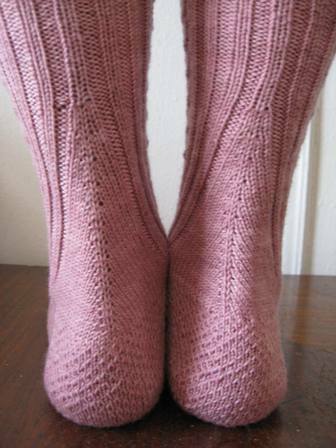 I loved the shaping on the back and the way it flowed into the eye of partridge heel flap. Here’s another shot of the shaping…it’s such a nice design. I took this shot a little while ago to show you the lengths I will go to to avoid dpns. Yes, that’s 3 circs I’m on. And yes I could have used my usual 2 but I was curious about using 3 to see how “fidely” it would be to have all that stuff dangling. It was actually fine, I didn’t love it but I didn’t hate it either. 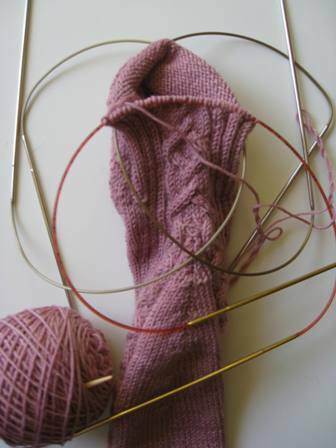 Just one more thing you can do with circulars. 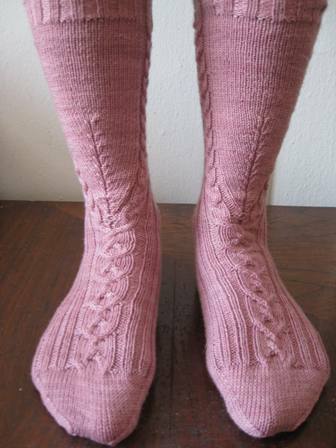 The changes I made were to improve the fit since I love my socks to practially cut off circulation. 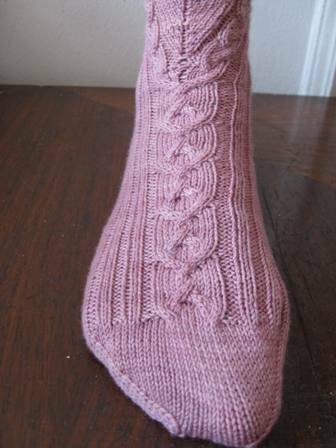 I did one repeat less on the heel flap to make it a bit shorter. 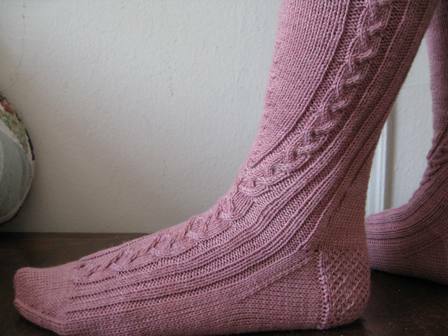 5 repeats of the instep pattern. And I decreased to 36 stitches instead of 44 on the first part of the toe shaping then down to 20 stitches (10 on each needle) to graft the toe. They fit perfectly…Overall, 2 thumbs up!! Twas in store yesterday to buy needles before trip, but no Denise. I love those socks they are so cool looking. I might have to knit those sometime. Love the socks. You must have quite the stash of finished socks by now. Of course, there can never be enough.